Tin Shop | Our Team — Tin Shop | Bar & Restaurant Development | Washington, D.C. In 1992 Geoff Dawson took a break from his work as a carpenter and residential contractor and opened Bedrock Billiards, which remains a neighborhood favorite in Adams Morgan, D.C. Since then, Geoff has been the creative force behind over 25 bars and restaurants in Washington DC, Philadelphia, Austin and Nashville. After rolling out five Buffalo Billiards, he returned to his passion for creating unique concepts at each new location. In the process, he has built a strong team of craftsmen, managers and staff that ensures quality and excellence every time. 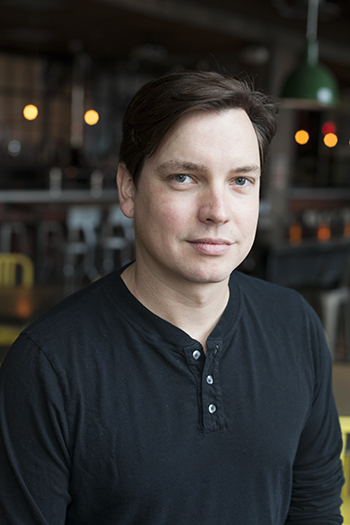 In 2013, Geoff teamed up with former Bedrock Billiards manager Peter Bayne and founded Tin Shop, a creative team that dives into all aspects of bar and restaurant design, build and operation. Thus far, the Tin Shop team has created Penn Social, Highline RxR, Big Chief, Smoked & Stacked, and Franklin Hall. With Church Hall up next, Tin Shop is adding to their stable of popular DC nightspots. The team at Tin Shop is also available to consult with restaurateurs and developers. Jack of all trades — master of some — Peter enjoys taking the dream of a business and making it a reality. He embraces the creative challenge of building a business that becomes part of the local community. He often states that he is not in the bar business, but in the business of connecting people. The relationships that are formed at a local gathering space is the very fiber of community, and is what makes a neighborhood special. Peter has over 16 years of bar and restaurant experience that began with bussing tables and checking ID's, and worked his way up to being a general manager before investing in his own business 6 years ago. A native Washingtonian and family man, Peter’s passion is working with the Tin Shop team to design and build beautiful bars that create a fun community for both customers and staff. Sam, another native of the DMV, spent the first five years of his career working in the real estate industry. After graduating from Georgetown University and spending a few years in Manhattan, Sam decided to head back home to Washington, DC. With extensive experience in analytics and underwriting, he helps manage the operations and business development lines under the Tin Shop umbrella. Tony has been in the DC bar business for over 22 years. During that time, he has worked in casual bars, fine dining, and everything in between. His experience spans pretty much any position imaginable and includes everything from event planning to managing both kitchens and bars. However, he found is passion in management, where he has thrived. Tony first joined the Tin Shop team in 2014 as the General Manager of Highline RxR. He has gone on to open Big Chief, Franklin Hall, and Church Hall with the team. While still maintaining his current role as General Manager at Franklin Hall, Tony also oversees daily operations and management of all other Tin Shop entities.